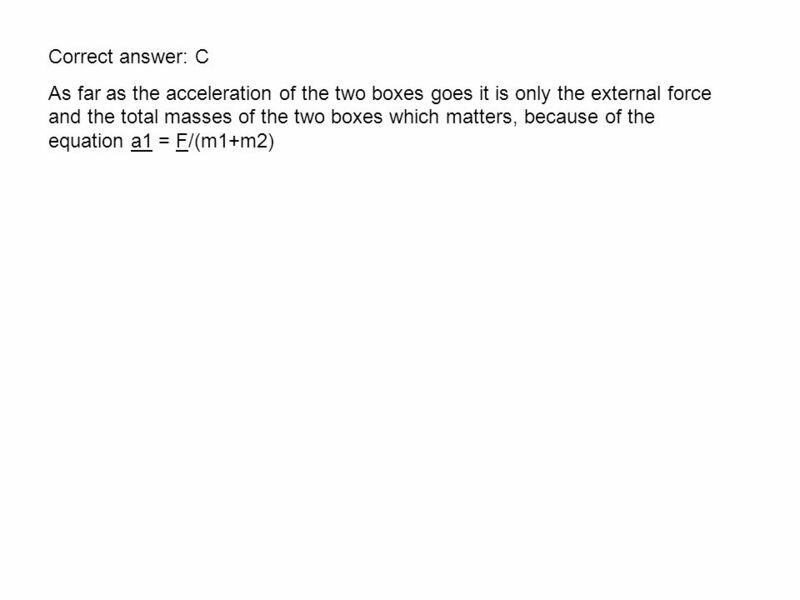 2 Correct Answer: C Since the two forces in the force pair are equal and opposite, it follows from Newton’s second law (F = m a) that m a = - M A, which gives us A = - (m/M) a In most cases the thing that you push off has more mass and thus doesn’t accelerate as much as you do (like when I jump off the floor, or when the book and the Earth pull on each other). 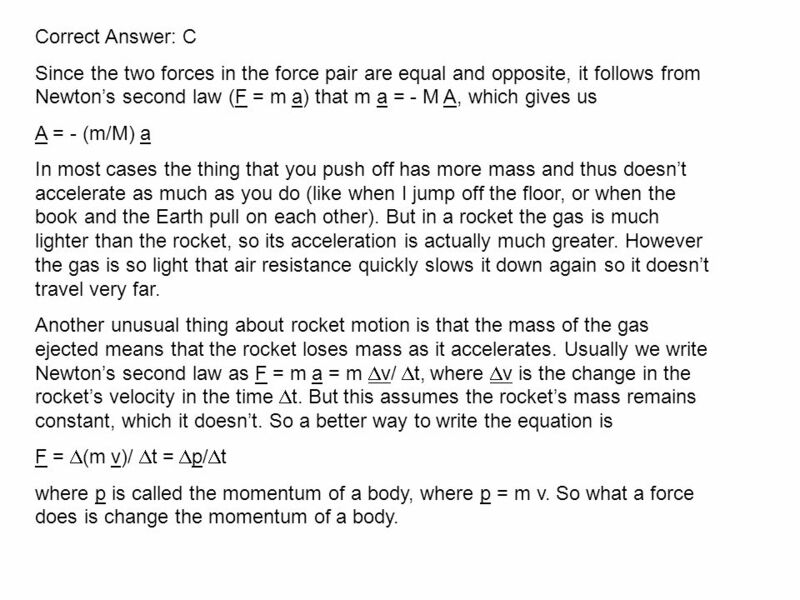 But in a rocket the gas is much lighter than the rocket, so its acceleration is actually much greater. However the gas is so light that air resistance quickly slows it down again so it doesn’t travel very far. Another unusual thing about rocket motion is that the mass of the gas ejected means that the rocket loses mass as it accelerates. 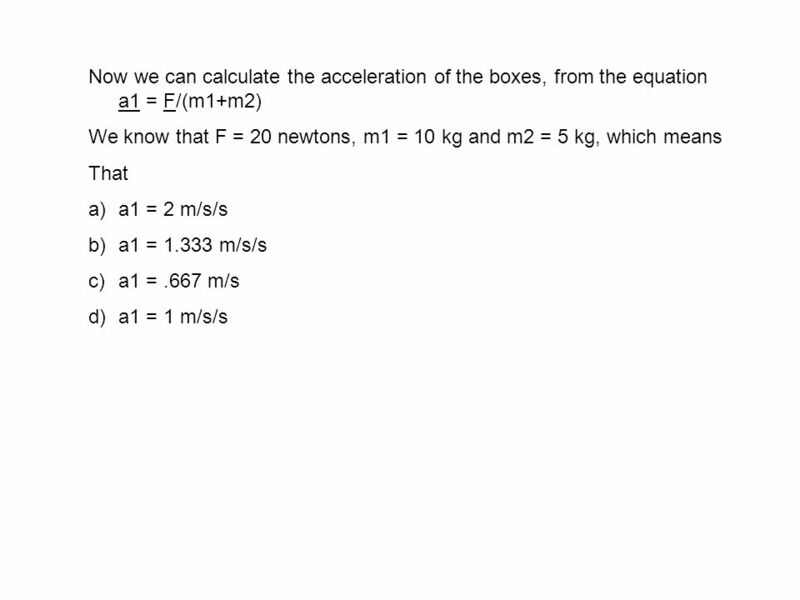 Usually we write Newton’s second law as F = m a = m  v/  t, where  v is the change in the rocket’s velocity in the time  t. But this assumes the rocket’s mass remains constant, which it doesn’t. So a better way to write the equation is F =  (m v)/  t =  p/  t where p is called the momentum of a body, where p = m v. So what a force does is change the momentum of a body. 6 Correct answer: B Note that it couldn’t be a whole number, because 15 doesn’t go into 20. 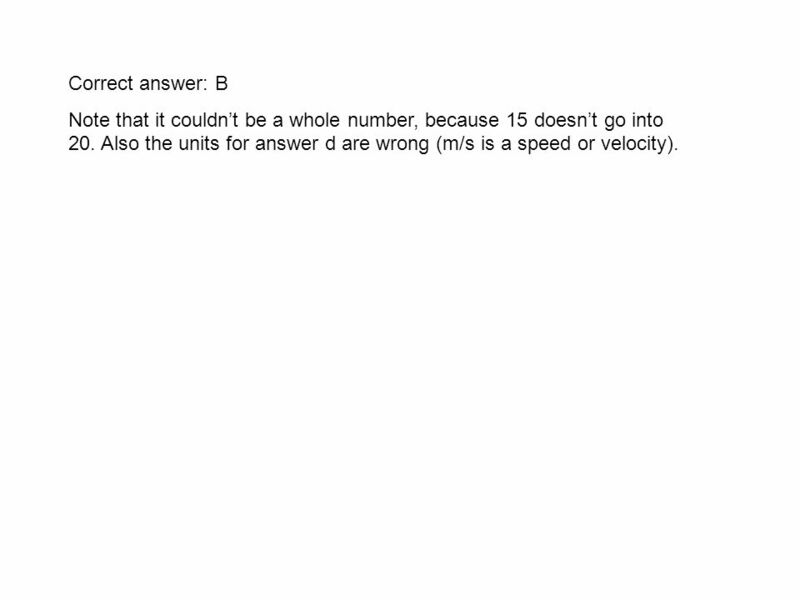 Also the units for answer d are wrong (m/s is a speed or velocity). 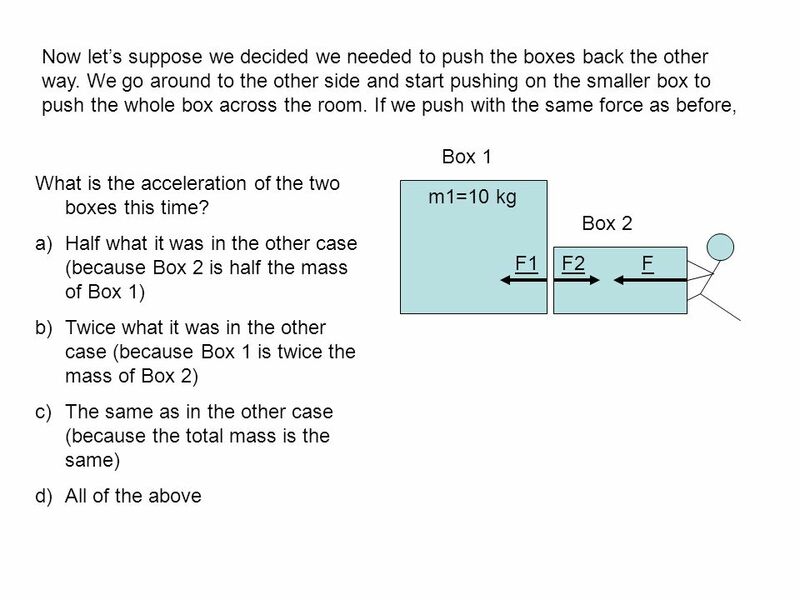 7 If we want to calculate the forces between the two boxes F1 and F2. What should our strategy be? 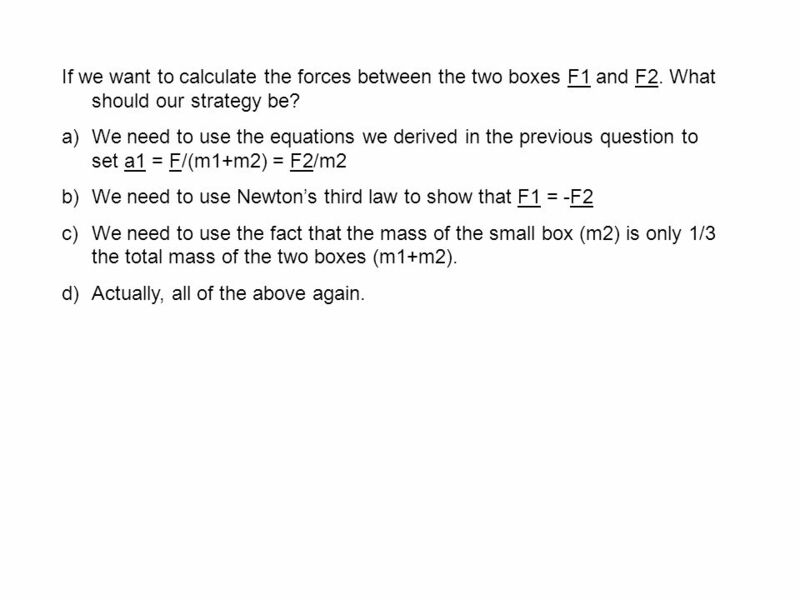 a)We need to use the equations we derived in the previous question to set a1 = F/(m1+m2) = F2/m2 b)We need to use Newton’s third law to show that F1 = -F2 c)We need to use the fact that the mass of the small box (m2) is only 1/3 the total mass of the two boxes (m1+m2). d)Actually, all of the above again. 8 Correct Answer: D again! But A is the main point, the other two being fairly obvious. Clearly we can use the equation given in a) to calculate F2 and get a1 from this. 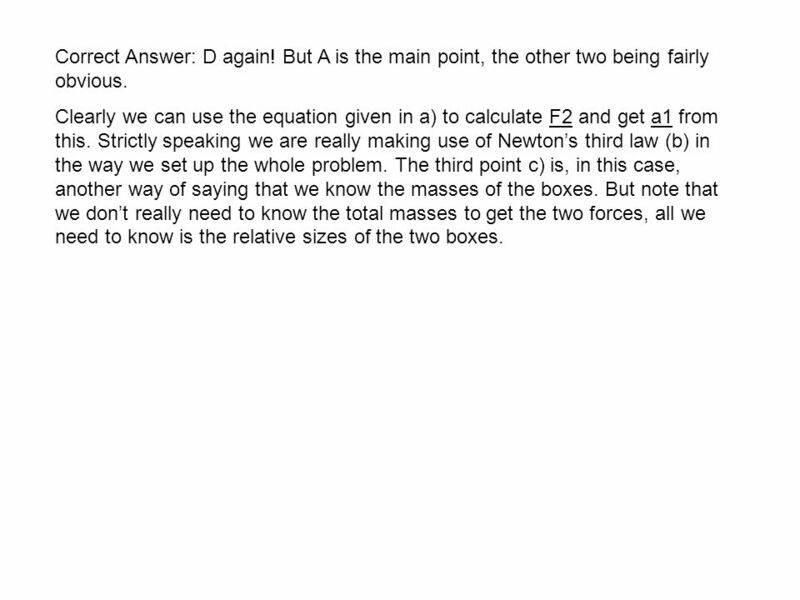 Strictly speaking we are really making use of Newton’s third law (b) in the way we set up the whole problem. The third point c) is, in this case, another way of saying that we know the masses of the boxes. 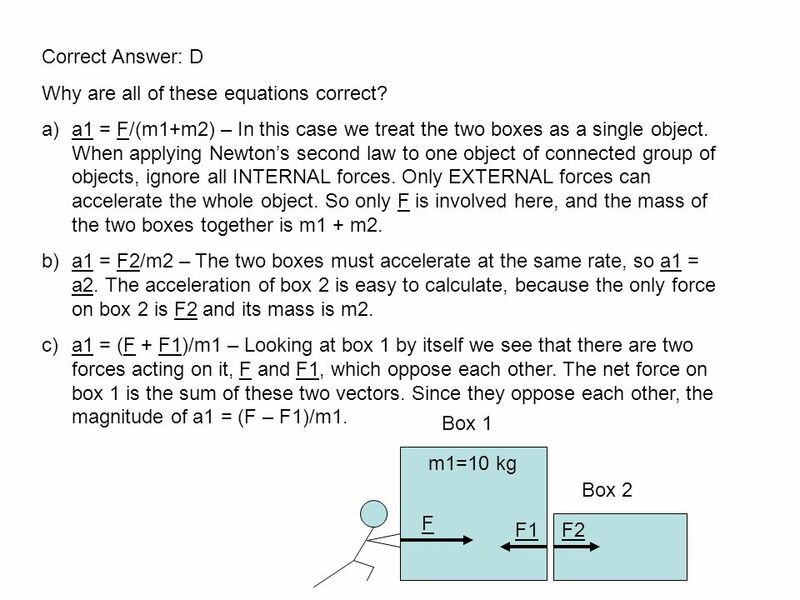 But note that we don’t really need to know the total masses to get the two forces, all we need to know is the relative sizes of the two boxes. 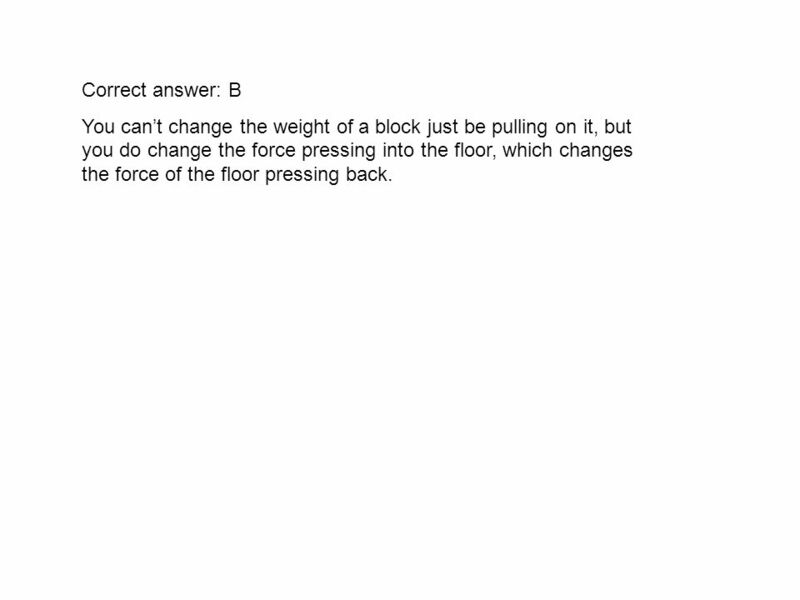 12 Correct answer: B You can’t change the weight of a block just be pulling on it, but you do change the force pressing into the floor, which changes the force of the floor pressing back. 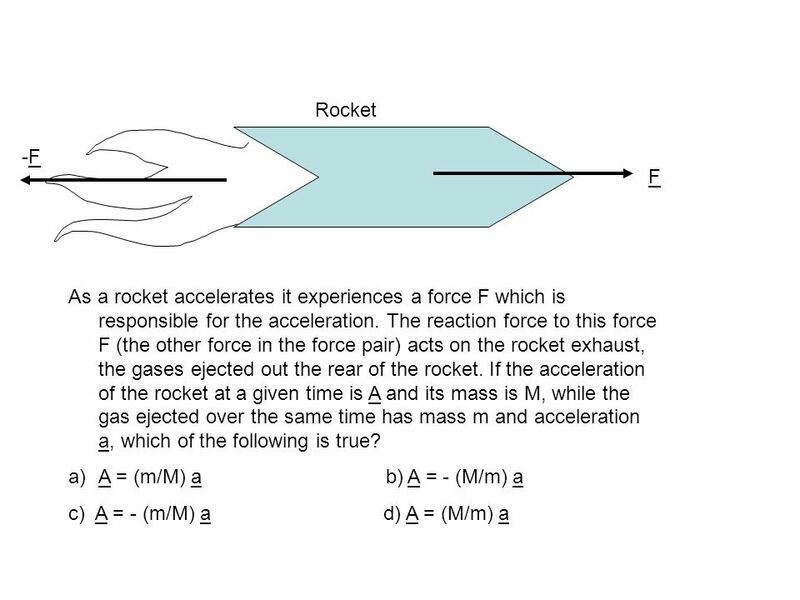 Download ppt "F As a rocket accelerates it experiences a force F which is responsible for the acceleration. The reaction force to this force F (the other force in the." Chapter 3 Force and Motion. 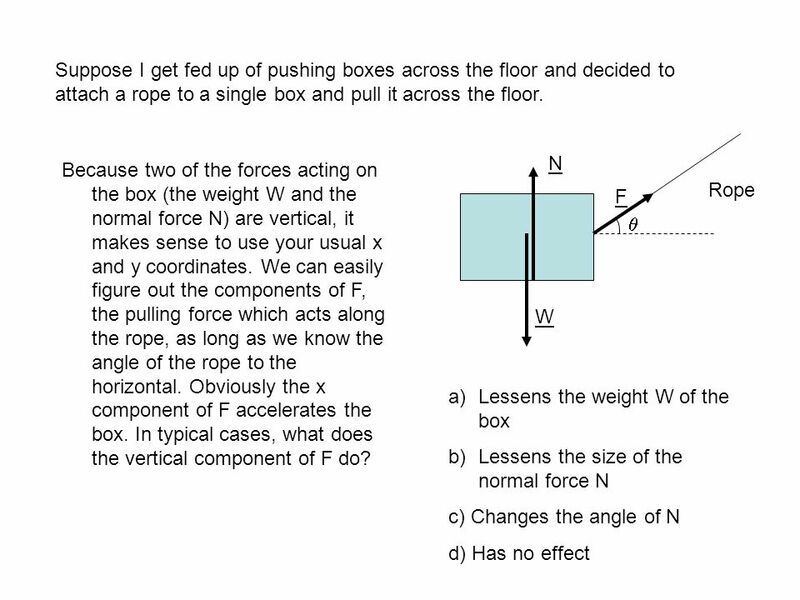 Applying Forces (Free body diagrams). 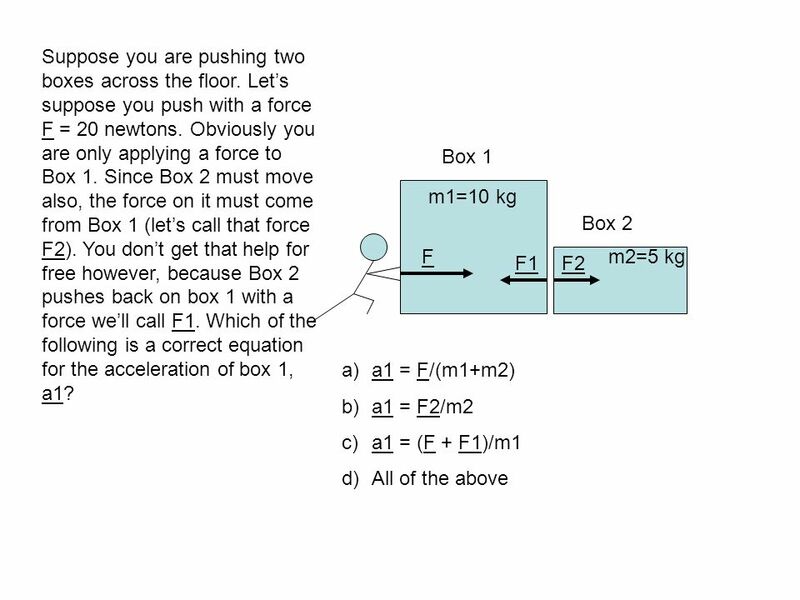 AP Physics Chapter 5 Force and Motion – I. Chapter 5 Force and Motion (I) Kinematics vs Dynamics. Chapter 5 Newton’s Laws of Motion. 5-1 Force and Mass Force: push or pull Force is a vector – it has magnitude and direction. Weight is a force that is defined from the gravitational attraction between two masses. The gravitational force causes the less massive object to accelerate. The Laws of Motion Newton’s Three Laws. What is a Force? It is something we experience every single day. You are exerting a force on your pencil right.